Chung, it seems, is no stranger to the legal system, with a police record going back to 1883. Ten years later, he and customer D.E. Dorsey were arrested at Chung’s laundry at 1st and San Pedro for fighting over a bill. The next year, he was arrested on a charge of battery when he got into an argument with Mrs. D.W. Diaz, operator of a Spring Street rooming house, who refused to pay him because he lost some of her laundry. Also in 1894, he and Ah Sing were fined $1 for not hitching their horses as they plied the streets of Los Angeles. But all of that was a mere prelude to the current problem. In 1907, Chung opened a new laundry on Thompson between West Adams and 23rd Street, much to neighbors’ dismay, for the council had designated the area a residential district, banning laundries, livery stables, undertaking parlors and coal yards. Chung was arrested once more, but because he wasn’t a U.S. citizen, he took the case to federal court rather than the state, claiming that the city had no authority to create what we know as zoning. 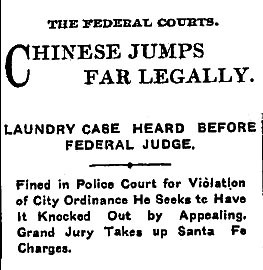 Chung’s lawyer maintained that as long as the laundry was sanitary, the city had no authority to force him out. Taking the case under advisement because there were few legal precedents, the federal court ruled in June against Chung and in favor of the city. 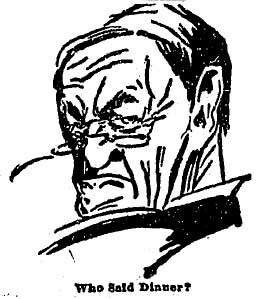 Chung remained out of the news until 1932, when the health department refused to renew his license because he had a connecting hallway between his living quarters and laundry. No obituary appeared on Chung and he isn’t listed in the California death records, so there’s no easy way to find out what became of him. As for the laundry, Thompson doesn’t appear on any of my historic maps and the Sanborn Maps website doesn’t recognize my firefox browser. Here’s the link in case you want to check.